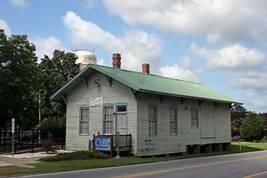 Garner got its start with the coming of the railroad through the area beginning in 1847. In that year, after a tie-breaker vote by the Speaker of the State House of Representatives, what is now Garner was chosen as the loc ation of a station of the North Carolina Railroad between Goldsboro and Charlotte. "Garner's Station" was established with the construction of a post office in 1878 and the Town of Garner's Station incorporated in 1883. There are several legends as to how Garner got its name. One story has it that Thomas Bingham named the town. Bingham is said to have combined a general store with handling the mail. Since Webster's defines "garner" as a "granary," hence figuratively, a "store," he named the town "Garner."